Categories: Building Owners, Building Owners News, Financing, Financing News, Tenants. Keywords: Green Leasing, Split Incentives. Under most net leases, energy costs are paid directly by tenants and building owners aren’t driven to invest in efficient building systems. Conversely, in many gross leases, building owners pay energy expenses and tenants have little incentive to save energy in their leased space. This dynamic is commonly referred to as the “split incentive” barrier to energy efficiency. The Institute for Market Transformation (IMT) and the US Department of Energy’s Better Buildings Alliance are working to identify and promote strategies to align financial and energy incentives for landlords and tenants. This includes developing resources to encourage ‘green’ or ‘energy-aligned’ leasing, educating brokers on the importance of energy efficiency in commercial real estate, and engaging tenants to undertake efficiency improvements in leased space. Why Are Green Leases Important? Green leases combine the productivity, comfort and sustainability features that tenants are looking for in commercial space while supporting landlord priorities of improving the triple bottom line and occupancy rates. In addition to achieving both tenant and landlord objectives, green leases have social, economic and environmental implications for companies operating in today’s global economy. Green leases truly are the future of commercial real estate. Open your EE and financial doors by visiting the Green Lease Library today! Categories: Building Owners, Building Owners News, Financing, Financing News, Latest News, Tenants. Keywords: Green Leasing, Split Incentives. WASHINGTON, D.C. (May 20, 2015) — Green leases have the potential to save the U.S. office market $3.3 billion annually, cutting energy consumption by up to 22 percent in leased buildings, according to a new study released today by the Institute for Market Transformation (IMT). The report, What’s in a Green Lease? Measuring the Potential Impact of Green Leases in the U.S. Office Sector, provides substantial evidence that energy-aligned leases, or green leases, can open the floodgates for energy efficiency solutions in America’s largest energy users—buildings. The report analyzes low-cost and low-risk steps to slash utility expenses through the signing of green leases, and explains how all lease types can benefit from adding various energy-saving clauses that cut costs, improve comfort and productivity, and reduce carbon emissions. Traditional standard leases typically discourage both landlords and tenants from investing in building improvements by separating costs in a way that creates a “split incentive”—a problem that’s frequently cited by property owners as the number one roadblock to energy efficiency projects. This problem occurs most frequently in leases where tenants pay for energy usage but the landlord is wholly responsible for capital improvements. In these cases, landlords have little incentive to improve a building’s energy efficiency while tenants bear the brunt of poor-performing systems. 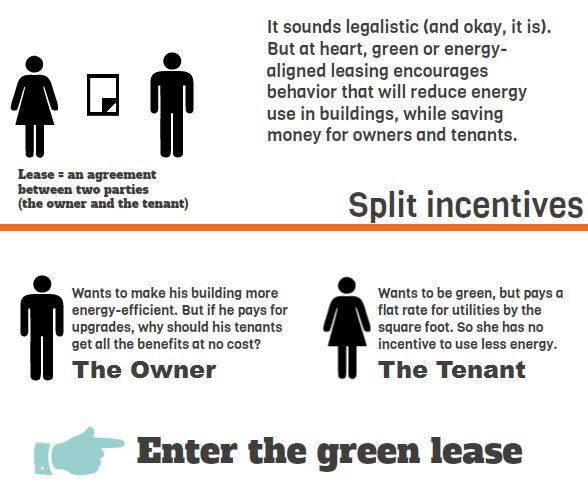 Green or energy-aligned leases address the split incentive problem by linking financial incentives with sustainability actions to increase a building’s performance. By including a handful of new or modified clauses in a traditional commercial lease, both owners and tenants can better realize the benefits of investing in energy efficiency. Savings Pass-Through: Landlords can choose to avoid amortization and other payback mechanisms in favor of adopting lease language that allows the landlord to recoup all operational savings resulting from energy efficiency improvements. Energy-Efficient Tenant Buildout: Requiring tenants to meet basic sustainability guidelines through the lease or building rules can ensure that their spaces are high-performing and efficient as core building spaces. ENERGY STAR Appliances: ENERGY STAR–rated appliances save an average of 20 percent over conventional appliances, and can be easily required through a tenant lease. Plug Load: The efficiency of tenant spaces can be improved by allowing half of the traditional tenant plug load without any disruption to the tenant experience. Submetering: A straightforward way for landlords to make tenants aware of their utility bills and energy consumption and align incentives to install submeters in tenant spaces, and bill tenants according to actual energy use. In addition, the report asserts that green clauses share similar concepts with popular green rating systems such as LEED and ENERGY STAR, and they can help expedite the process of obtaining the credits needed for these certifications. The full report is available at www.imt.org, and additional green leasing resources are available at www.greenleaselibrary.com. To learn more about green leases in action, visit greeneleaseleaders.com to read about the Green Lease Leaders recognition program, presented by IMT and the Department of Energy’s Better Buildings Alliance. This year’s Green Lease Leaders designees will be formally announced and recognized at the Bettter Buildings Summit in Washington, D.C. on May 27. ABOUT IMT: The Institute for Market Transformation (IMT) is a Washington, D.C.-based nonprofit organization promoting energy efficiency, green building, and environmental protection in the United States and abroad. IMT’s work addresses market failures that inhibit investment in energy efficiency and sustainability in the building sector. For more information, visit imt.org and follow us on Twitter at @IMT_speaks.